Peter Frances, senior editor, DK publishing • 2012, 528 pp. 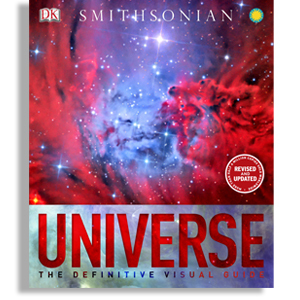 Universe: The Definitive Visual Guide covers a lot of sky. The fun starts with a thorough introduction to physics, covering matter, gravity, time, distance, radiation and relativity, presented with admirable info-graphics. A four-page timeline of the universe starts when everything-there-is was compressed into a dot 1026 meters across, and as hot as 1027 degrees. Two full pages cover the evolution of fundamental particles during the first billionth of a second. Our guess is that, hungry for astronomical eye-candy, you’ll open the book at random. You may stumble across a two-page photo of the sun’s surface — looking like a purple coral waving in a gentle, tropical sea. Or an amazing spread of richly captioned photos showing Saturn’s rings, moons and weather. A page and a half covers the famous crab nebula — a supernova remnant where a Mixmaster of X-rays is fringed by a chaotic halo of visible and infra-red light. After an overview of the formation, distribution and variety of galaxies, you get treated to a superlative swath of nature photography, including a portrait of Andromeda, a galaxy twice as big as the Milky Way, and thumbnails of the Pinwheel, Spindle, Antennae and Sombrero Galaxies. Who gets to coin these names? More than 150 pages show the constellations through the year, in both hemispheres. It’s no state secret that the last shuttle landed in July 2011, 15 months before publication. Momma, don’t let your children grow up to make mistakes at the front of a book! And I’m not sure anybody cares about the long lists and thumbnails of galaxies and asteroids that look rather like a high school yearbook. But these are quibbles about a stunning achievement. The excellent photos and diagrams are clearly the sales point, but the text is clear, unobtrusive, and clairvoyant enough to answer questions when they arise. One more thing: Those gorgeous, detailed photos, especially the two-page spreads, will remind you that, much as we worship the digital image, print deserves an enduring place.